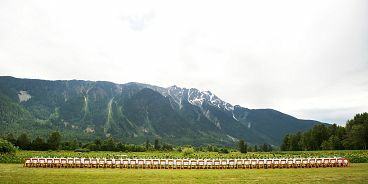 On Sunday, August 21st, 2016 Araxi Restaurant’s Executive Chef James Walt and Restaurant Director Neil Henderson will welcome 400 guests to the sixth annual Araxi Longtable Dinner – the largest single longtable in British Columbia history – nestled under Mount Currie at the picturesque North Arm Farm in Pemberton. As in years past, guests will enjoy a multi-course menu served family-style – with many of the ingredients picked on-site just hours before – and wine pairings from British Columbia’s top wineries selected by Wine Director Samantha Rahn. Adding excitement to the event, Chef Walt is debuting the follow-up from his James Beard-nominated first cookbook – even before it is available to the general public. The aptly named Araxi: Roots to Shoots, Farm Fresh Recipes’ will feature many of Chef Walt’s favourite Longtable recipes as well as classics from Araxi Restaurant’s dining room. Guests can purchase books in advance and collect a signed copy at the event. The Araxi Longtable Dinner will take place on Sunday, August 21st, 2016 at 3pm at North Arm Farm, Pemberton. Tickets cost $159 plus tax and gratuity, and include a cocktail reception and four-course dinner with wine pairings. Cookbooks are $37.95 plus tax. The Araxi Longtable Dinner sells out quickly; tickets can be purchased online HERE. Event inquiries can be made via email at longtable@araxi.com.